Finding People is our Specialty! The Most Trusted People Locator since 1996 – with a 96% success rate! That’s right, we find 96% of the people we are asked to locate and it is one of the most rewarding services we provide. Our proven methods for finding people lead to winning results. We change people’s lives! Visit www.legallocatorservice.com and check out our Testimonials page regarding some of our searches we have completed Nationwide. Our clients include, among others, Members of the Legal Profession, Banks, Credit Unions, Private Clients, Oil Companies, Property Managers, Hotels, Retail Companies, and more. 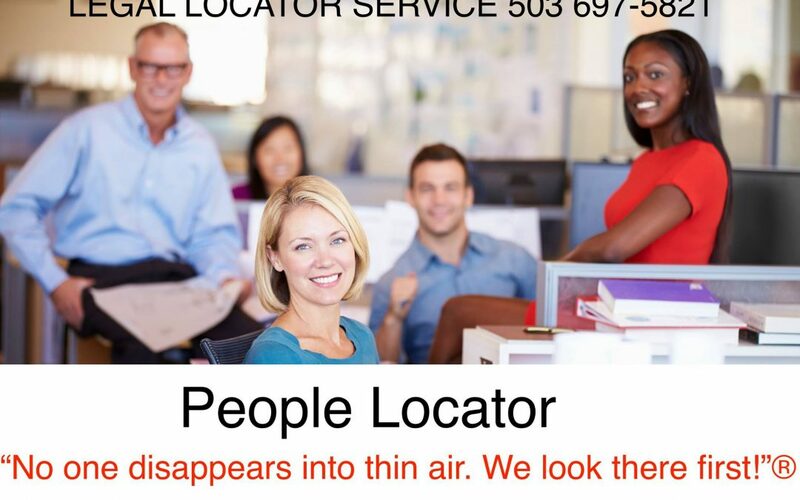 With our People Locator Service, we never give you a list of names which might be the right person. We find the right person the first time, every time. Our team puts in extra effort to find the exact person in each search we perform. We are not a database website. We have access to real time information that is not available to the public. Every search starts with an email, fax, or a quick chat with us. We will tell you specifically how we can help you and the cost for the search. Who do you need to find? Serving Oregon, California, Washington and Nationwide. What Does it Cost for a Private Investigator to Locate People?